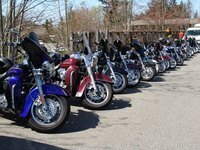 When Harley owners come together, there is a feeling of pride and camaraderie, and many riders buy so-called HOG patches to commemorate membership in a local chapter or participation in a rally. The patches are proudly displayed on a leather vest or jacket. However, sometimes the patches do not get sewn on due to a lack of sewing knowledge or skill. Sewing a patch onto leather is not hard to do, but takes some planning and knowledge. Choose thread that is 100% polyester or nylon and has no cotton content. The tannin used to prepare the leather is not compatible with cotton fibers, and cotton thread will eventually rot. Place the patch so that it is visually pleasing. Do not measure where you think the patch should be placed, for example, in the center of the vest's back. The actual measurement of the center may not be the visual center. Flatten the lining on the inside of the vest. The lining should not be folded or wrinkled, or the patch may cause the garment to fit awkwardly after it has been sewn on. If you are sewing a patch onto the shoulder, make sure that you have enough lining left to allow the vest to move naturally. If the lining thread is easy to snip away and resew, you can sew the patch onto just the leather, and then refasten the lining after the patch has been secured. Pin the patch where you want it to go, and then put the vest on. Make sure the lining is pinned as well. The patch may look different than it did when lying flat, depending on how the vest fits and how the leather moves with the contours of your body. By trying the garment on with the patch attached, you can immediately see exactly how it will look when it is worn. You can also use spray adhesive to keep the patch in place. Sew the patch to the vest, starting form the inside, along the trim edge. Use small stitches and place them so that they are nearly invisible. Use a thimble to push the needle through the leather. Do not venture into the colored area of the patch when you are sewing. If your patch has no trim edge, use thread that will match the leather or the outer color of the patch. If the lining of the vest shows at the bottom of the garment, sewing on a patch is a good way to move the lining up to where it should be. A stain or hole can also be covered up with a patch. Do not trim anything away from the edges of your patch. It may ravel and you may end up being unable to sew the patch onto your vest. XL Forum: What Do I Need to Sew Patches on Leather? How Do You Sew Embroidered Patches on Jackets?